Coach Mike White is really looking at all possible avenues when it comes to recruiting and his next trick could be a hidden gem in Jonah Antonio, a 6’5” Australian born shooter that won’t be hidden for much longer. Antonio will be heading to junior college after a productive freshman year up in division-1 and Coach White and assistant coach Al Pinkins have identified him as a floor spacer who could really compliment the future roster. Coach White has had a major JUCO transfer success story already in his time at Florida with Justin Leon, a JUCO All-American who had actually committed to White at Louisiana Tech and was planning on taking a redshirt. 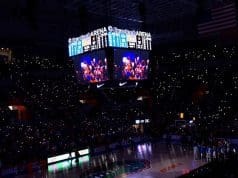 When White took the Florida job, he instead found himself immediately playing a key role in the SEC, leading the Gators in 3-point percentage for both of his years in Gainesville and starting on the team that made an Elite Eight two seasons ago. With so much potential movement in the college basketball offseason with the NBA Draft and transfers out, Antonio could be a marquee transfer addition in the spring or summer that could be immensely more valuable than any 2019 recruit left available that late in the cycle. Could Antonio be the next impact transfer for the Gators? I took some time to talk with him about his decision to transfer to JUCO, why Australians are so tough, and how to properly eat the Australian delicacy that is Vegemite. EF: Hey Jonah! Thanks so much for doing this and for being so accommodating. Why don’t we start off by telling people where you’re from originally, where you played last year, and where you’re playing this upcoming season. JA: I’m originally for Perth, Western Australia. Came over to the states when I was 16 and played at Sunrise Christian Academy in Kansas for my junior and senior year. Last year I attended Mount Saint Mary’s and right now I’m enrolled to play basketball at South Plains Junior College in Texas. EF: That is quite the basketball journey. 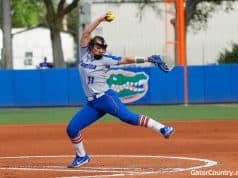 When did the Gators offer you for? JA: 2019-2020, it will be after my year at JUCO in South Plains. EF: When did Florida first contact you and what did they have to say? JA: I would say late May, they didn’t have any scholarships for this year but they are losing two shooters I believe in Jalen Hudson and KeVaughn Allen. So the plan was to send me to South Plains, evaluate me some more, and then take me the following year. I didn’t jump on the idea quickly though as I had 8 offers from South Dakota State, Vermont, Oakland, Wright State, NKU, etc. so I had to think about it a lot. EF: That is one thing I want readers to know that maybe aren’t used to the Gators recruiting JUCO players…you are a division-1 player in skill, talent, and production and it showed with how much you played as a freshman, a whopping 33.5 minutes per game starting a ton at shooting guard in the backcourt with one of my favorite players in Junior Robinson. For people who didn’t have a chance to watch any Mountaineers games last year, how would you describe your game to them? JA: My game is developing, as you said in my first year of college basketball I put up some pretty solid numbers. My game is based around threes and any type of three-point shot, I believe in time I’ll be the best three-point shooter in college basketball. Fans could compare my game to Klay Thompson or a JJ Redick. Something that will surprise fans and coaches is my athleticism. Also, another thing about being from Australia is that my game has a lot of grit and toughness to it, that’s just the way we play over there. I’ll never back down from anything to get a win. EF: You averaged 2.8 threes per game last season breaking the Northeast Conference record for threes made by a freshman which is no small feat! And of course, any white shooter is always going to have his athleticism undersold (laughs). I definitely see some Klay in you, especially with your pump fake to get your defender in the air followed by a side step into a three, something I saw from you multiple times. It’s interesting you mention toughness because that’s something I was going to ask you about. It seems like every Australian basketball player is TOUGH. Like, EXTREMELY tough. Andrew Bogut, Matthew Dellavedova, Joe Ingles, Aron Baynes…some of the toughest guys in the NBA, all Aussies. What makes players from down under so tough? JA: Honestly it’s a really simple answer, growing up in Australia everyone plays Australian Football Rules, AFL which is one of the toughest sports on the planet. If you asked any of those blokes in the NBA what sport they played growing up they’d tell you footy, we love it over there and it ingrains toughness in us young. I didn’t pick up a basketball until I was around 13, played footy all my life. EF: Oh man, you better believe I stay up until 3 or 4 in the morning to watch AFL games! For anyone who hasn’t watched, it’s a way faster (and in my opinion, better) game similar to rugby. And it is PHYSICAL. If basketball doesn’t work out for you I know you can always go back to footy because I know there are scouts that have taken players from college basketball and taught them to play and now play in the AFL. You’d obviously have a head start already knowing and loving the game (laughs). You mentioned athleticism being an underrated part of your game and I’m going to throw out another one. You take incredible care of the ball. You were 3rd in the nation in turnover rate, making you one of the most responsible ball handlers in the country. How do you remain so disciplined with the ball while also being an offensive weapon always looking to score? JA: Yeah mate footy is great, no pads either! Well really I just play my game and I know a good way to earn minutes is to rebounds, make threes, defend, and don’t turn the ball over! So I make an effort to take care of the ball and try to make the right play every time down the court. EF: I’m a big fan of Jamion Christian who coached you at Mount St. Mary’s (now at Sienna) and I know he is really demanding on the defensive end. What were some of the traits of how your team played defense and how did you fit into that? JA: Coach Christian is a great coach and a basketball mastermind. 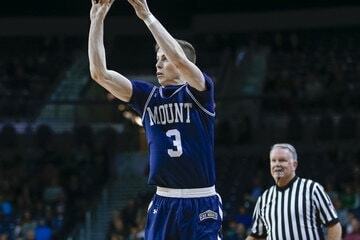 He is definitely going to be one of the premier coaches in college basketball in years to come. Well, we started off the year playing man defense and I was our primary defender for guarding the opposition’s best player, we would press the entire game go back into man. Coach Christian called it “Mayhem.” After around 10 games into the season we went to a zone, so press to a zone which I wasn’t a huge fan of as I take pride in my matchup and making a guy’s night a rough one, but it’s what we needed as a team. EF: It’s cool that you have that desire to lock a guy up in a one on one matchup and it’s also good you have the versatility to be effective in man and zone defenses. What are you going to be focusing on about your game this upcoming season at South Plains? JA: Well, really just working on my handle and coming off ball screens, getting experience making the right reads, more off the bounce rather than catch and shoot and by the end of the year there with the way I work I’ll master it and be ready to contribute wherever I go! EF: It must have been a tough decision to go to South Plains instead of staying at Mount St. Mary’s or transferring to another division-1 program and sitting out a year. Does your decision to go the JUCO route, allowing you to transfer back to division-1 without having to sit out the 2019-20 season, mean there is a lot of mutual interest between you and Florida or do you just like the transfer options you’ll have by going this route? JA: Yeah it was a tough decision but something I’ve thought about heaps, it will give me a chance to play right away and develop my game on the court. Yeah I’ll be eligible right away. 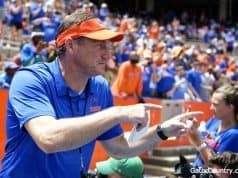 I have a huge interest in Florida, I think their style of play and the coaching staff is great, but I also liked my options going the JUCO route. I have a lot of schools after me and it allows me to really be recruited. EF: You can bet I’ll be keeping up with you this year and I’m sure your recruitment will blow up even more while you’re in Texas. What are you looking for most in a school for when you head back to division-1? JA: For sure! And really just fit and relationship with coaches! At this point level won’t be an issue as the schools recruiting me are mostly in the power 5, I’ll just be looking for a place where my game fits and there is a need for a three-point shooter of my caliber! EF: I’m sure any team would have a need for that! (laughs). One last question for you. Being Australian, do you eat Vegemite? EF: (laughs) I’m Canadian so maybe I’m a bit more open to it but I still find it challenging (laughs). I can go for Vegemite and some melted cheese on toast but like you said, can’t be eating the black stuff straight out of the jar! Thanks for doing this my friend, I’ll be sure to check in with you throughout the year. JA: Yeah (laughs) that’s awesome mate! And yeah, sounds good, look forward to talking to you, you seem like a great bloke! Next articleWill the SEC adopt NFL-style injury/availably reports?